Arbor Garden Tree & Landscaping has been serving the Denver metro area for 23 years. 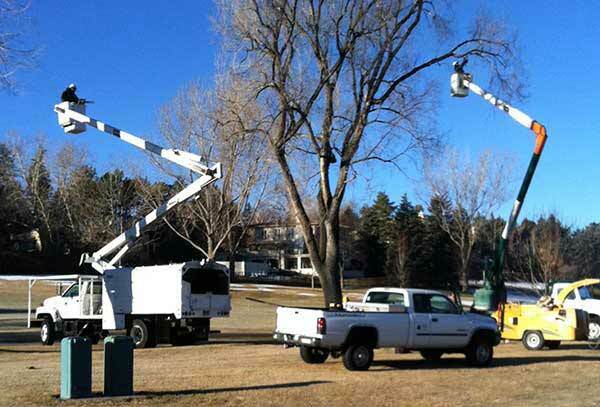 We began in 1994 with one truck and now have a full service arborist business. Our locally owned and operated company is proud to serve Denver metro area residents and business owners including the Denver Country Club, Castle Pines Country Club, city and county governments, various homeowners associations and private homeowners. Our knowledgeable and certified arborists would be more happy to provide you with tree trimming, tree removal, tree planting and landscaping services. When you’re ready to get started give us a call at 303-722-8820 or fill out our contact form today. We want to make sure that your investment in trees and shrubs reaps the reward of beauty and enhanced property values. Arbor Garden's principal owner, David Clarke, has over 30 years of experience in the tree care business. Equipped not just with tools, trucks, machines and manpower--but with specific arbor care knowledge for Colorado's environment. 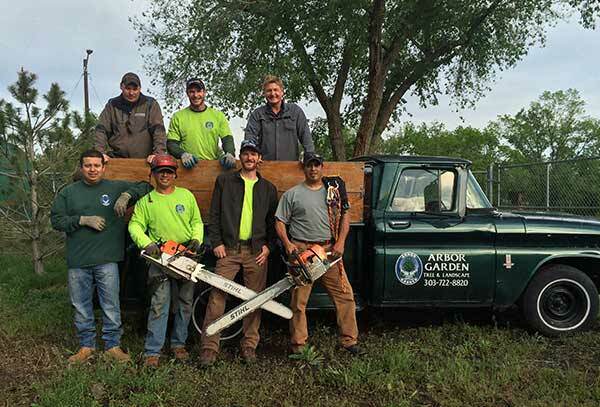 Arbor Garden remains the preferred tree care provider along the Front Range. Arbor Garden has built its reputation for excellence by continually satisfying tree care needs of homeowners, businesses and municipalities. We love your trees like you do! Arbor Garden has been protecting Denver's most valuable resource since 1994. We want to hear from you. Tell us what's on your mind or describe the work you need done. At Arbor Garden, we understand how trees respond to pruning. Even in the best conditions, trees require pruning to help them coexist with their surroundings and to channel energy into attractive foliage and structure. However, pruning is a delicate procedure that carries many risk if not performed correctly. Each time a tree is cut, you can change its growth or cause damage to its health. Furthermore, different plant types require different techniques for pruning. 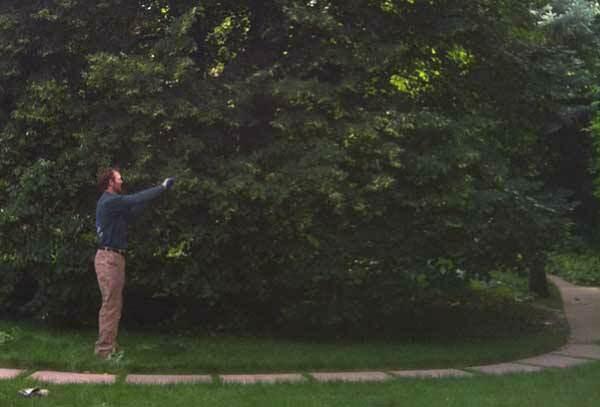 Removing foliage from a tree reduces the tree's ability to feed itself through photosynthesis and may stunt its ability growth. That's why you'll want to have our certified arborists at Arbor Garden to caring for your trees. We have the expertise, skill, and equipment to prune your trees safely, avoiding the risk of personal injury or damage to your property and trees. Arbor Garden will help you determine what type of pruning is necessary to maintain or improve the health, appearance, and safety of your trees. Adding new trees and shrubs to your landscaping creates a beautiful lasting impression for your family and friends for years to come. There are many benefits to planting trees, including environmental factors, increasing property values as well as providing a metaphor for life and growth. If you are looking to create an environment worth sharing with family and friends, plant new trees in your yard. Businesses can also benefit from an increase in business traffic by adding trees to their property. Trees add to the aesthetic value of the property and slow people down. They are beautiful, majestic and provide many benefits to the climate around them by providing shade, oxygen and clean air. With full-service planting and landscaping in Denver, Arbor Garden can help recommend appropriate trees and shrubs for your property and lifestyle. Contact Arbor Garden today at 303-722-8820 for a professional consultation or fill out our contact form. Tree stumps on your property are more than just an eyesore. Leaving behind tree stumps can cause a whole host of landscaping problems including insect infestation, weed growth, and lawn damage. Unwelcome animals and insects such as termites and ants often use leftover stumps to make their home. Once on your property, many of these creatures find their way into your home. Similarly, certain types of weeds thrive nearby stumps. The difficulty of lawn care in the areas surrounding a stump promote weed growth on a property. Finally, landscaping is made more time consuming and difficult when one has to navigate around stumps. Even worse is the potential to damage to your landscaping equipment when mowing or trimming in these areas. Arbor Garden’s trained arborists have the necessary skills and equipment for safe tree and stump removal. Give us a call today to get started on unsightly stump removal. A barbecue in your backyard, a round of golf, or a picnic in the park are not as enjoyable if people are surrounded by defoliated, ailing trees. Arbor Garden's Plant Healthcare Department can prevent or remedy these problems. Some companies use the highly ineffective process of repeated "shotgun" spraying, a practice we disdainfully call "spray and drive away." Arbor Garden develops pest management plans uniquely designed to treat specific trees and eliminate specific pests on your property. We take factors like weather, seasons, plant types, and environment into consideration to create a comprehensive strategy to maximize results and optimize plant health. While pesticides sometimes become necessary, Arbor Garden believes in using more effective alternative methods to bring about a higher quality of well-being to plants and the property on which they reside. Our certified arborist have a proven track record of creating greener and fuller growth. Don’t let insects and/or disease ruin your property, contact Arbor Garden now! Our Integrated Pest Management (IPM) approach replaces needless spraying with more targeted injections to control insects and plant disease. Arbor Garden feels strongly that MORE pesticides are not the answer. Arbor Garden uses the IPM approach to control insects whenever possible. Integrated Pest Management (IPM) is a highly effective and environmentally sensitive approach to pest management that relies on a combination of common-sense practices and extremely well-researched measures. Our IPM programs use current, extensive information on the life cycles of pests and their interaction with the environment. Combining this information with available pest control methods allows us to manage pest damage by the most economical means, and with the least possible hazard to people, property, and the environment. Our overall goal is to bring the best possible health and well-being to plants and the area around them. Start preventing and fighting insects and plant diseases on your property today!